All of the below was examined in October 2010. The Federation reports its annual expenditures in its annual report, using a standard accounting breakdown (employee benefits, relief supplies, transportation, equipment, travel, communications, workshops and training, information, legal, professional and consultancy fees, administration, office and general, etc. )11 We have not found other breakdowns of its expenses, such as by region or program. Neither the annual reports nor other sources give a comprehensive account of IFRC's activities (except at the broadest level) or a sense for how IFRC's funding breaks down by program/region. IFRC. Haiti: 9-Month Plan of Action. IFRC. Haiti: Operations Update 2. IFRC. Haiti: Operations Update 7. IFRC. Haiti: Operations Update 8. IFRC. Haiti: Operations Update 10 (PDF). IFRC. Haiti: Operations Update 16. IFRC. Haiti earthquake 2010: One-year progress report (PDF). IFRC. News: Press releases. http://www.ifrc.org/news/press.asp?navid=06_02 (accessed January 10, 2010). Archived by WebCite® at http://www.webcitation.org/5vdtXn3hf. IFRC. Publications: Annual report. http://www.ifrc.org/publicat/ar/index.asp?navid=09_05 (accessed January 10, 2011). Archived by WebCite® at http://www.webcitation.org/5vdtSMQvC. IFRC. Tsunami real time evaluation synthesis report (PDF). IFRC. Real Time Evaluation (first round) - Recommendations and Responses (PDF). IRFC. Where we work: Haiti (2010). http://www.ifrc.org/where/country/cn6.asp?iYear=1&xFlag=2&countryid=80&v... (accessed January 5, 2011). Archived by WebCite® at http://www.webcitation.org/5vWEINzdc. IFRC. Where We Work: Monitoring and Evaluations. http://www.ifrc.org/where/evaluation/index.asp (accessed November 27, 2010). Archived by WebCite® at http://www.webcitation.org/5uYMjTsHp. IFRC. Who We Are. http://www.ifrc.org/who/movement.asp (accessed October 2, 2010). Archived by WebCite® at http://www.webcitation.org/5tBJTSBio. “Nearly 100 members of the International Federation of the Red Cross and Red Crescent Societies (International Federation) around the world have provided assistance in tsunami-affected countries. The American Red Cross coordinates and forms operational alliances with these Participating National Societies (PNSs) based on the technical expertise, established geographic presence and operational capacity of each.” American Red Cross, "Tsunami recovery program: Three-year report," Pg 5. 2. IFRC, “Operations Update 2,” Pg 1. The report gives the percentage of the appeal amount raised; the donated amount was calculated by multiplying the appeal amount by the percentage raised. 3. IFRC, “Operations Update 7,” Pg 1. The report gives the percentage of the appeal amount raised; the donated amount was calculated by multiplying the appeal amount by the percentage raised. 4. IFRC, “Operations Update 16,” Pg 1. The report gives the percentage of the appeal amount raised; the donated amount was calculated by multiplying the appeal amount by the percentage raised. 5. IFRC, “3-month report,” Pg 1. The report gives the percentage of the appeal amount raised; the donated amount was calculated by multiplying the appeal amount by the percentage raised. 6. IFRC, “6-month report,” Pg 1. The report gives the percentage of the appeal amount raised; the donated amount was calculated by multiplying the appeal amount by the percentage raised. 7. IFRC, “9-month plan of action,” Pg 11. 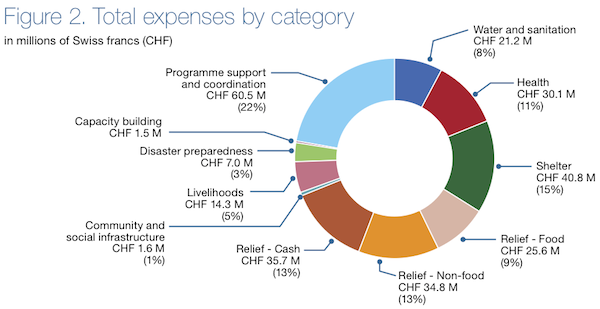 "Total Red Cross Red Crescent income through September 2010: 1,118.5 million Swiss francs. Total Red Cross Red Crescent expenditure through September 2010: 273.1 million Swiss francs." IFRC, "Haiti Earthquake 2010: One-Year Progress Report," Pg 5. "The financial information in this report combines unaudited data from 26 independent National Societies (listed below) and the IFRC's secretariat, which is conducting Haiti relief and recovery operations on behalf of 95 National Societies which contributed directly to its Haiti appeal." IFRC, "Haiti Earthquake 2010: One-Year Progress Report," Pg 32. IFRC, "Haiti Earthquake 2010: One-Year Progress Report." IFRC, "Haiti Earthquake 2010: One-Year Progress Report." Notes on how IFRC defines the reported outputs and how the data was collected are given on Pgs 37-47. IFRC, "Annual Report (2008)," Pg 22. "The Sudanese Red Crescent Society faced an acute watery diarrhoea epidemic affecting the country. Supported by the IFRC, the National Society assisted 360,000 people. The World Disasters Report 2008 focused on the challenge of HIV in disasters and crises. The report recommends that all humanitarian programmes should integrate the complexity and longterm nature of HIV and AIDS in order to effectively tackle the epidemic. Typhoon Fengshan struck the Philippines destroying over 75,000 houses, seriously damaging a further 200,000 and affecting at least 2.5 million people across the country. The Philippine National Red Cross assisted 6,000 families over 12 months.” IFRC, “Annual Report (2008),” Pg 6.